It’s not about the lust for power. It’s about the need for a grander world. Enlightenment is the birthright of all mankind; the Supernal is there for all to grasp. Do you have a plan to take us there? No? Then step back and let us show you the way. 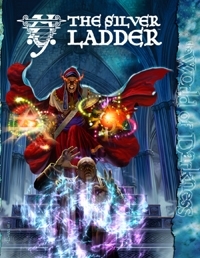 • The history, methodology and ultimate goals of the Silver Ladder. • Internal functions of the Silver Ladder, from initiation into the Cryptopoly to their complicated codes of law. • New spells, Artifacts, imbued items, Legacies and characters to pursue the shared dream of Hieraconis. This title was added to our catalog on July 09, 2008.